This, the first epic poem ever written in English, tells the tale of the great warrior Beowulf, kinsman to King Hygelac, and his magnificent ascent to glory and eventual descent into honorable death. Beowulf sails across the sea to save King Hrothgar and his people from the terrible beast Grendel. 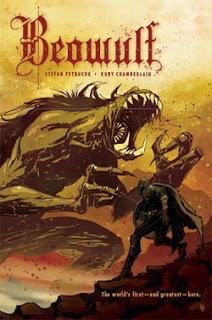 Grendel, as all evil beasts were, is a descendent of the biblical character, Cain. He suffers at the sound of the men rejoicing in the King’s mead hall, giving thanks to God. Filled with hatred, Grendel ascends upon the great hall every evening to destroy any humans that dwell there. Hearing of King Hrothgar’s horror, Beowulf and his men sail across the sea to rid the King of his thorn. Beowulf greets Grendel in the great hall sans his sword and shield prepared for glory and death. Beowulf does not attack. Rather, he holds fast and wears the beast down eventually snapping his arm off at the shoulder. Grendel retreated to his mother’s lair to die and Beowulf hung the arm on the hall entrance as a reminder of the deed done. Word spread of Beowulf’s deeds and many rejoiced. King Hrothgar showered the warrior with gifts, but Grendel’s mother sought revenge and entered the hall and spilled more blood. So Beowulf followed Grendel to his mother’s lair beneath the waters of the moor, seeking death and glory. He nearly drowned in the dead pool, had it not been for Grendel’s mother. She saved him from the creatures of the deep so she could kill him herself. In her den Beowulf found a sword of the giants – one which no other mortal human would be able to wield – and with it he destroyed the mother. He took Grendel’s head and the hilt of the giant sword back as gifts to the King. Because of his deeds, Beowulf is rewarded, and ruled his own land for many years until a great red dragon appeared. When a slave steals a golden cup from a dragon’s hoard, the beast takes retribution against the people burning everything in his path. So Beowulf, in his twilight years, donned his sword and shield to do battle once more. His warriors, in fear, ran from the red dragon, save one, Wiglaf, who stood with Beowulf. Together they destroyed the reptile, but in the process Beowulf was fatally wounded. Beowulf gave his weapons to Wiglaf, last of his kin then died. Beowulf was then honored in a burial pyre. After his death hard times fell on the Geats. Petrucha’s adaptation is a modern retelling of this ancient, oral tale. The story is not poetic in nature, but it is no less engaging. In fact, this translation offers a lot in the way of important and interesting details. In this version we learn that Grendel is from a race descended from Cain, and therefore his is an accursed race. This book is written in modern English, which makes this story very accessible to readers, especially young readers, thus requiring less adult intervention. The art is also very modern in that it is created with hard, square lines and a significant amount of contrast. There is also a good balance of text and images. It took me a while to realize what is different about this comic as opposed to other comic works. Finally I realized that Petrucha never uses any onomatopoeia (bamb, pow, boom). The use of such terms is not problematic; in fact, it could be that not using these terms gives the graphic novel a certain seriousness that may not be possible when onomatopoetic sound effects are utilized. The decision to leave them out worked well for this particular title. The vocabulary of this book is easier than other translations because of the modern English, but the blood factor is about the same. Ripping an arm off is ripping an arm off; no matter how you slice it, there will be blood. When recommending to someone younger than 12-years-old, I would use some discretion but not be overly timid. With teens, I would have no reservations at all. It is the story of Beowulf so there is some fantasy, human-on-monster violence, but no more than is in THE HOBBIT or THE LORD OF THE RINGS. So much could be done with a piece like this. A high school class could discuss the religious implications of the literature in relation to the time it was created. How did the literature affect later cultures and religious beliefs? Students could also discuss the different translations and the movie adaptation and compare and contrast those pieces. One could also study BEOWULF as a catalyst for the modern English mythology. How has BEOWULF influenced other pieces of literature, namely J.R.R. Tolkien’s world? Younger students could use BEOWULF as a way to help them develop their own mythologies. This is ripe for the “text-to…” discussions that teachers use. BEOWULF is important to study as a piece of classic English literature. It is the first recorded epic poem written in English, albeit Old English. The great thing about this piece is that it is a modern retelling, which allows contemporary youngsters to connect with old literature, ultimately creating an appreciation for and placing a value on traditional literature in the minds of young readers.